The FA has announced it is to stream Saturday's FA Cup clash between Chelsea vs Cardiff on it website, marking the first time a match including one of the so-called Big Four has been made available live on the web. So far, seven FA Cup matches have been streamed through the FAtv website but this one is being seen as a watershed moment for the technology. Speaking about the occasion, FA chief executive Ian Watmore said: "This is another important step in the delivery of FAtv as a premium streaming service, and we fully expect this weekend's webcast to be one of the single most viewed football matches on the internet." If this is to be the case, the match will have to viewed by more people than World Cup qualifier England vs Ukraine, which was shown back in October. There is a decent chance that this will be the case, however, as the Chelsea match will be streamed for free. In the presenting booth will be Jim Rosenthal whose pre-match build-up will start at 11.40am. Kick-off is set for 12:00. 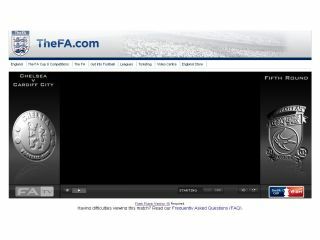 Go to www.thefa.com/fatv for more details.